A dead bay minke whale washed ashore on Jenness Beach, New Hampshire. Experts say it likely died after getting tangled in fishing lines and crews added insult to injury when they tried to move it. Rye Police Chief Kevin Walsh it was a coordinated effort to remove the dead animal from the public beach. 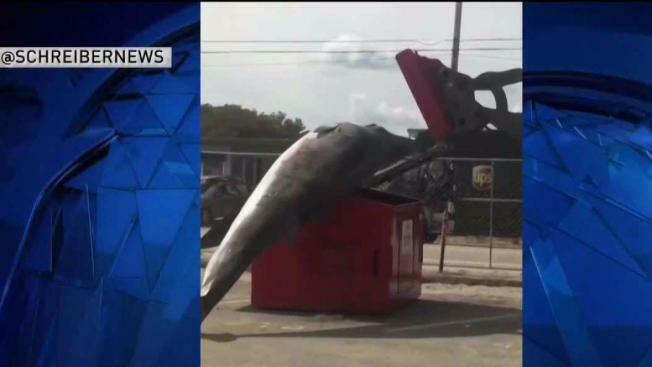 The town called on the state to bring in the dumpster to help transport the whale for a necropsy. He says the problem was simple miscommunication. When asked why they still attempted to put the large animal in the too-small container, Walsh said they had a strategy. The operator of the front-end loader was trying to drop it into the dumpster diagonally to let the tail stick out. “And then we had a way we were going to cover it up,” Walsh said. That didn’t work. So the 16-foot whale spent Monday night in the beach parking lot until a larger container was brought in on Tuesday to haul it away. “That was a mistake that shouldn’t have happened and I take full responsibility for that,” Rye Police Chief Kevin Walsh said.